Wee Lil' Blog: Pail Liners-Which One is Right For Me? Pail Liners-Which One is Right For Me? You've decided you want to cloth diaper. You've done the research and you know what detergent you want to try and which diapers look like they'll work for your family, but have you considered how you'll store the dirty diapers between washes? Well there are two basic kinds storage for your diapers. You can use a hanging wet bag like the apple green FuzziBunz to the left or you can use a pail liner in a pail like the blackberry Grovia shown below. 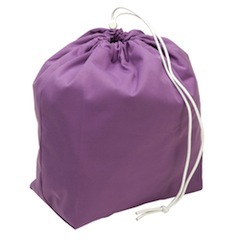 Hanging wetbags: One of the perks of a hanging wetbag is that it doesn't take up a lot of space and that it can be moved here and there without any issue. 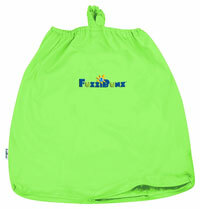 If you're short on space in your little one's room (and that's where you're planning on keeping your wet bag), this kind of bag is perfect for you. You can get these kinds of bags in both drawstring style and zipper style. 1. Put your pail where it will be both convenient and out of the way! There's nothing worse than tripping over a dirty diaper pail or having kids get nosey and dig around in there. Eww! We keep ours in the bathroom. 2. Buy at least 2 pail liners or hanging pails. You'll want to be able to wash one and use one all at the same time. I've done it with just one and it works if that's the way you have to go, but it's so much more convenient to have 2. 3. When in doubt, buy the bigger one. If you're between a couple of sizes and not sure which to get, buy the bigger one. They always seem like they'll be bigger than they are when you read how many diapers they can hold. Buy the one that is meant for large amounts of diapers. That way, if you're having a bad day, you don't have to wash diapers too just because you ran out of storage space. I think Black Berry Grovia Pail Liner is good. If u hv big room then you use Pail Liner genuine.First i will face the same problem i don't take decision which one is better for me but it now easy for me.